Are Gold Jewelry Stamps Accurate? What Qualifies as 10K, 14K, 18K or 22K jewelry? Is the gold content on a piece of jewelry the same as what it is stamped? If a chain is stamped 14K, does it mean the chain’s gold content is actually 14K? These are all very common, fair and reasonable questions. As a very active gold buyer, I deal daily with these issues. The quick answer to this question is “not exactly”. This article explains why there is a disconnect between the figure stamped in a piece of jewelry, and the exact gold content of a piece of jewelry. This articles assumes honestly manufactured jewels. No fraud. I buy gold on a daily basis, grade gold items constantly, and get refining statements several times a week. I have been doing this since November 2009. Based on this experience I have developed great knowledge on how to grade gold jewelry based on its gold content. Let me share this info with you. I am excellent at this. I am sharing this knowledge with you. Gold jewelry is never pure gold. It is always an alloy. Gold jewelry alloys are of a high gold content. These alloys are called “Carat Gold”. To create a piece of jewelry, pieces of carat gold are assembled together by soldering. Soldering ads weight but affects the percentage of gold mass in the jewel. To better understand this, it is important to first know what is carat gold, how jewelry is assembled, soldering and what qualifies for the stamped grading. High gold content alloys are called “Carat Gold”. Carat gold is gold alloy graded at six carat (6K) or above. Six Carat (6K) is 25% percent gold. Carat gold ranges from 6K (250 parts per 1000) to 24K (999 parts per 1000). Click here to learn how this is calculated,. Carat gold is the material that is used to make the jewelry components. Jewelry is assembled buy putting together carat gold jewelry components. The more components a jewel has, the more pieces it has been assembled from. On one extreme, a simple wedding band is typically made out a single piece of shaped karat gold. On the other extreme, a chain is made of a lot of individual pieces of karat gold that have been connected together. These pieces of karat gold are kept in place by soldering. See diagram below. Gold soldering is the process of attaching pieces of carat gold together so that they become a single piece. To accomplish this, pieces of carat gold are put as close together as a possible, heated up, and all the gaps left are filled with melted “gold solder” alloy. 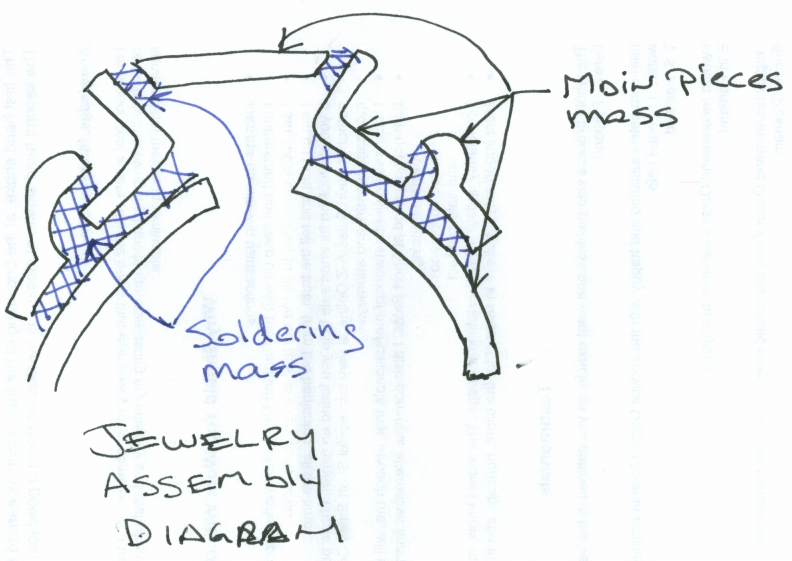 For this to happen, the gold solder alloy needs to melt and flow at a lower temperature than the pieces been soldered. Otherwise, all the pieces would melt together in the process. Gold soldering alloys are gold alloys formulated for soldering specific types of carat gold for specific applications. Therefore, gold soldering is also carat gold. Assuming that the manufacturer intends to keep the grade of the jewelry as close as possible to the carat stamp grading, the gold soldering alloy will be as close as possible to the grade of the pieces to be connect while still melting sooner. For example, soldering alloy for manually connecting to larger pieces of gold will typically be of a carat grade extremely close to the carat grade of the main pieces. On the other hand, the carat grade of the soldering used for a machine mass produced small link chain will be of a much lower grade than the main piece. This type of soldering is called “paste soldering”. Honestly manufactured gold jewelry is stamped based on the carat grade of the components used to create the jewel. For example, if the chain is manufactured based on assembling fourteen carat (14K) links, then it “qualifies” as fourteen karat (14K). The actual gold content on a gold jewel is the amount of pure gold in comparison to the total mass of the object. Assuming honest manufacturing, the more gold soldering used, the more additional non-gold mass is added to the piece. Therefore, even though the piece may qualify as for example “14K”, it does not mean that the actual gold content is “14K”. It may be somewhat less. Usually that depends on how much soldering is used. For example, a chain made of larger links typically will have the same actual caratage as what is stamped. A chain of the same weight but of smaller links, typically will have less caratage than stamped because it has a lot more links, therefore a lot of soldering. The carat stamp of a piece of jewelry is an indication of its gold content. The actual gold content of a honestly manufactured jewel is highly affected by the type and quantity of gold soldering alloy used. The more soldering, the more the actual caratage will be affected. A honestly manufactured jewel qualifies to be graded same as the pieces of karat gold used to assemble it. For example, if a honestly manufactured jewel is made by assembling 14 karat (14K) components, it qualifies as 14 carat (14K). However, if it has a lot of soldering, such as in the case of a small link chain, it may actually be 13 carat or 12 carat. A few months ago I bought a 24K flower pendant from Hong Kong. This is the highest caratage grade possible to manufacture. As you can see in the image below, the jewel is made of a lot of components. I had the item tested with X-Ray based spectrometer. The leafs and petals of the flowers actually tested 24 carat. With the same equipment, the soldering points were tested. Those varied in grade but were all pretty high. Then item was melted and the whole mass scientifically graded again. The whole mass graded at 22 carat (22K). This is a great illustration of this phenomenon.